As long as there have been criminals, there have been governments thinking up novel ways to execute ’em. We don’t know which of the following gruesome methods the Founding Fathers had in mind with that whole ban on “cruel and unusual punishment,” but we know they had plenty to choose from. Pachyderms aren’t natural-born killers. However, with a little training (often involving practice coconuts), they’ll gladly stomp on the head of a criminal. The ancient ritual, which spread nearly everywhere elephants were found, was still in use as recently as the early years of British colonization. Crushings were usually public spectacles administered by abnormally large elephants – just in case the audience didn’t find the sight of an angry Dumbo squashing a human head scary enough. Deadly Debut: Nobody knows for sure. Somewhere in the Middle East, probably in the 7th century B.C.E. Although forever associated with one particular execution, crucifixion was the capital punishment method of choice in much of the ancient world. Marcus Licinius Crassus probably set the all-time record for crucifixions when, after defeating Spartacus in 71 B.C.E., he had an estimated 6,000 of the gladiator’s rebel slaves crucified along the Appian Way. Roman emperor Constantine the Great banned the practice in 337 C.E., but it cropped up again in the 16th century, in places such as Japan and Mexico. Today, Catholics in Iztapalapa, Mexico, crucify themselves annually as a devotional practice, removing the nails before fatal damage is inflicted. An idea worthy of a Bond villain, the tactic involved shutting victims inside the belly of a hollow, life-sized brass bull and lighting a fire below it, essentially turning the apparatus into an oven. Legend has it that a reed-based acoustic mechanism made the victims’ screams sound like a bull’s bellow, while the smoke from inside blew out its nose. 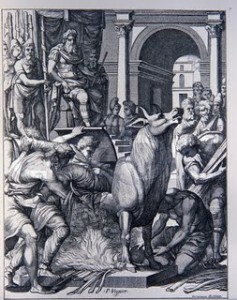 As for Phalaris, he eventually got an inside look at his own device when he was overthrown by Telemachus and became the bull’s next meal. Snakes in a cave! Part execution, part nightmare, the Cave of Roses required locking victims in a dark cave filled with a smorgasbord of venomous snakes and other unpleasant creatures. With no way to escape and no way to see, the condemned knew it was only a matter of time before their movements provoked some creepy crawler to deliver a fatal bite. The Cave of Roses was finally abolished in 1772, and, fortunately, Sweden grew a lot more enlightened with time. Exactly 200 years later, it became one of the first major European nations to ban the death penalty completely. Man overboard! A punishment specific to sailors, keelhauling meant tying a man with rope, dropping him off the front of a ship, then dragging him “across the keel” from bow to stern. A long haul took several minutes, during which time the victim would drown (though being dragged along the barnacle-covered hull certainly facilitated things). Shorter hauls, conducted for less-severe crimes, left sailors scarred but alive – a practice that became popular with pirates as well as government navies. Used both for torture and execution, the donkey was a big hit in the Spanish military. A naked victim was forced to straddle the apparatus, which was basically a vertical wood board with a sharp V-shape wedge on top. Weights were attached to the offender’s ankles or feet, pulling them down onto the sturdy wedge until the victims split in two. Despite the name, no (non-human) animals were harmed in the making of this device. Believe it or not, this menacing device was actually created as a way of making executions less painful. Dr. Joseph Ignace Guillotin (who lent his name to, but didn’t invent, the contraption), was actually an anti-death-penalty activist who suggested it as a more “humane” form of execution. And he was right – to a point. While it was France’s last form of capital punishment, “last” didn’t come until 1977.